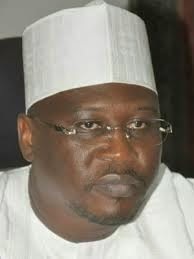 The Adamawa State House of Assembly stayed shut Monday for the second week running over attempts to impeach the Speaker, Umaru Fintiri. The House, scheduled to sit last week, shifted its plenary to Monday, April 27, following a threat by 11 out of 25 lawmakers to pass a vote of no confidence on Mr. Fintiri. Some lawmakers and staff who showed up for work on Monday were denied entry by policemen who said there was a directive not to allow anybody in. A statement from the 11 lawmakers, signed by their spokesperson, Umar Abdulkareem, representing Nassarawo/Binyeri, urged the opening of the House for normal legislative business. “We, members of the Adamawa House of Assembly under the leadership of Hon Jerry Kumdisi wish to categorically state that Adamawa state House of Assembly complex which is under seal should be unsealed to enable the house to resume its legislative functions,” the statement read. When contacted, Mr. Fintiri, who spoke through his chief press secretary, Solomon Kumangar, did not give a reason for the closure of the House but insisted that there was no stalemate.